Enjoy a StayCation 365 days a year! 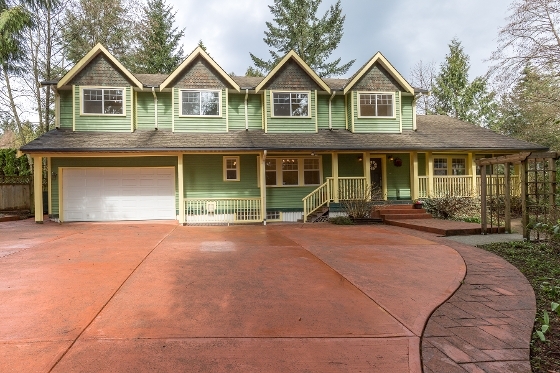 Amazing 14000sqft forested lot in Coquitlam West. Enter over Stoney Creek using your own private bridge! What awaits you is a 3lvl/3443sqft/4bed/4bath/19yr young custom-built home. Freshly painted, brand new carpets & updates throughout. Features: formal dining rm, huge kitchen w/island, eating area & spacious vaulted-ceiling living rm, all completely wrapped in massive windows offering tons of light & access to a wrap-around patio. Up: master w/walk-in & spa inspired ensuite, 2lrg rms, 4pc bath & flex space. Down: billiards sized rec rm & potential for 1bed suite. Bonus: over-height garage & tons of storage. Central to everything but far enough to call a retreat. OPEN HOUSE April 1 & 2 from 2 to 4.